The 2018 election may bring the most diverse set of candidates in U.S. history, Dante Chinni and Sally Bronston write. NBC’s Benjy Sarlin looks at how Democrats are divided over deficits. The Washington Post notes that GOP candidates will have to court Latino voters — which Trump has made particularly hard. Republicans are unleashing opposition research on the cycle’s new Democratic candidates, POLITICO writes. Kevin McCarthy is quietly shoring up support for his campaign for the speakership. 2020: Steve Bullock now says that he “would” support an assault weapons ban. AZ-SEN: What’s up with a Democratic group that’s up on the air trying to hurt McSally’s chances in the primary? FL: A Democratic wave still faces plenty of hurdles in Florida, writes the Tampa Bay Times. FL-SEN: Maybe Bill Nelson was right about Russian operatives having “penetrated” Florida voting databases? 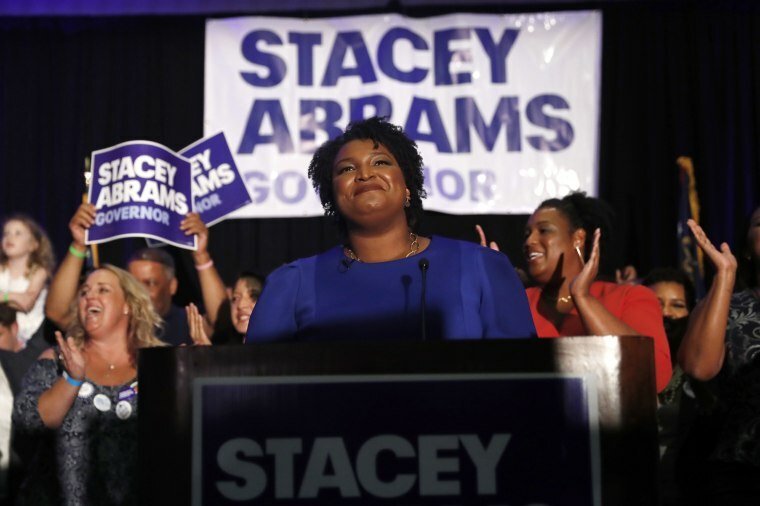 GA-GOV: The New York Times notes that Stacey Abrams defies some partisan labels. KS-GOV: The Wichita Eagle has a good look at the state of the race. PA: Democrats are working to figure out how to win back Trump voters in the Keystone state. WI-GOV: More former Walker aides are coming out in support for Tony Evers. WI-SEN: Courting cash from big donors is continuing to be a major issue for Leah Vukmir. WY-SEN: John Barrasso is contending with a primary challenge. John Brennan says he’ll go to court over Trump’s revocation of his security clearance. The New York Times reports that Michael Cohen is being investigated for bank fraud to the tune of $20 million. A White House speechwriter has been terminated after revelations that he spoke at an event attended by white nationalists. Democrats are being badly outspent in the ad war over Brett Kavanaugh, POLITICO reports. NBC’s Suzy Khimm writes that the Trump administration is taking a light touch with corporate bad actors. Prison reform may actually have a shot in Congress.